MainAll NewsInside IsraelEtzion Bloc Elections End 9:00 P.M.
Etzion Bloc Elections End 9:00 P.M.
Arutz Sheva speaks with contenders Yair Wolf and Davidi Perl. 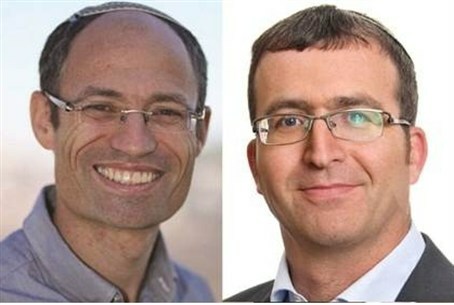 Polling booths opened at 8:00 a.m. in the elections for the position of Gush Etzion regional authority head, and will close at 9:00 p.m..
Arutz Sheva spoke to two of the top contenders – Yair Wolf and Davidi Perl. The winner in the election will serve only 18 months – completing the term of the former authority head, Shaul Goldstein, who recently was appointed to head the Nature and Parks Authority. Wolf, who has been serving as deputy head of the authority for 13 years, said, "The day began very well and many friends came to vote. There was a line at the booth at as early as 8:00." "A year and a half is a very meaningful period of time," Wolf insisted. "My experience is very important and in the last six weeks, I succeeded in bringing construction approvals to the community of Gvaot, budgets for 14 new kindergartens and construction of traffic lights at the junctions of Route 60." Davidi Perl, who is Director of Netiv Meir Yeshiva, told Arutz Sheva: "The change is already in the air and the residents of Gush Etzion already want a change in the regional authority. We see happiness on people's faces. "I will advance the entire subject of education – starting from the early ages and on to after high school… We will widen construction and deal with everything connected to youth and road safety," he promised. "We will not neglect the things that we invested in until today – tourism in Gush Etzion, maintaining Rachel's Tomb and the connection to the local authorities of Kiryat Arba and Efrat."